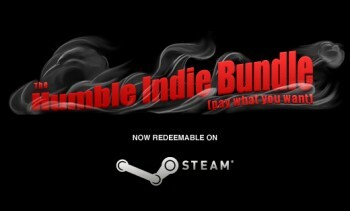 Gamers tired of horsing around with multiple installers can now activate the Humble Indie Bundle on Steam, and it looks like another Bundle deal is coming for the holidays. Back in May, five independent game developers got together to put World of Goo, Aquaria, Gish, Lugaru and Penumbra Overture into one big bundle of gaming awesomeness, which they then offered to the world in a "pay what you want" sale. And there was no minimum, so cheap jerks could pay a penny and get all the games technically guilt-free. To top it all off, you could even choose where your money went, directing it to the developers, the Electronic Frontier Foundation or Child's Play in whatever proportion you wanted. The whole thing was an amazing deal; great games, great sale and well over a million dollars raised, including more than $350,000 for charity. There was just one problem: It's five separate games, with five separate installers, and in today's fast-paced, "give me convenience or give me death" world, that's a whole lot of hassle. But no longer! The Humble Bundlers put their heads together with Valve and now anyone who purchased the package can activate it on Steam, meaning all five games are never more than a click away. Just log into your Humble Indie Bundle page using the information you were sent when you bought it and you'll be given a unique Steam key. Use that to activate the games on Steam in the normal fashion (click here if you haven't done it before) and you're off to the races. You can't actually buy the bundle over Steam; the offer is only available to people who picked it up during the original sale period back in May. But fret not if you missed out on that deal fantastico, because it appears that another Humble Bundle is being lined up for the holidays. Check out the Wolfire Games Blog to learn more.